There are many environmental and social hidden costs from Palm Oil production in Indonesia. 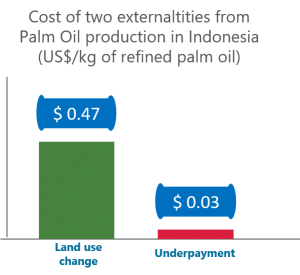 The figure above illustrates the two of the most significant externalities in palm oil production are land use change (environmental) and underpayment (social). Description: Using True Price and Trucost methodologies and data provided by TEEB, environmental externalities under different land use types and using alternative farm management were calculated. Social externalities were assessed to be comparable to environmental ones. Finally, it was demonstrated that internalizing part of these externalities would still lead to a profitable business model.